Beagle 2 lander - Solar System Planets And Moons Section. 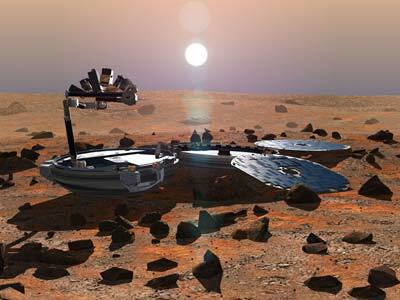 Mars Express attempts to reach Beagle 2 lander. Spirit rover Will Roll Off Secondary Ramp. After several attempts to collapse the airbag which is blocking Spirit's exit from the lander, controllers have given up that plan. Instead, they've decided to have the rover exit from one of the platform's alternate ramps. In order to take this northeastern route, the rover will have to back up and then perform a three-point turn in the tight space. Controllers will also fire a pyro device which will sever an umbilical cord connecting the rover to the lander. If everything goes as planned, Spirit will roll off the lander on the evening of January 14. Eye Tower Makes Hurricanes Stronger. NASA scientists have discovered that a "hot tower" of cloud rising above the eye of a hurricane can increase its intensity. The scientists used data gathered by the TRMM satellite; a joint project by NASA and the Japanese Aerospace Exploration Agency. After compiling statistics from several storms, they found that when a hot tower forms up to 15 kilometres above the eye, the hurricane will become much more intense within six hours. This research could help improve forecasts of which hurricanes have the potential to cause the most damage. Additional Attempts Fail to Reach Beagle 2. Mars Express has made several more attempts to reach the British-built Beagle 2 lander, and so far it hasn't received any communications. At this point the European Space Agency will go into a phase of radio silence until January 22, when Beagle 2 is supposed to go into a new communications mode where it will attempt to transmit a signal throughout the Martian day. It's expected that the teams will consider the probe a lost cause if it can't be reached by March.